In this activity, we will be estimating the area under the curve over the domain [0,12] using rectangles. Use the slider n to determine how many rectangles will be used. Use the slider d to determine where the rectangles will be used from. 1. 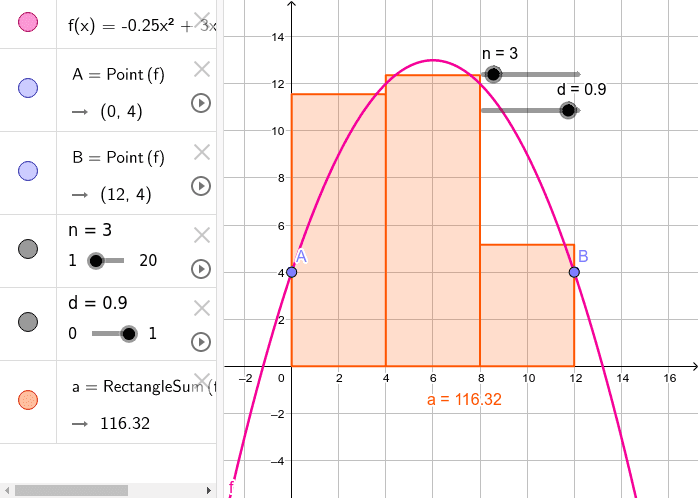 Determine the area under the curve with 6 values of n. Keep the d slider at 1. 2. Determine the area under the curve with 3 values of d. Keep the n slider at 8. 3. Make some guesses about the estimations that you just made. ﻿a. Which of your estimates from question 1 do you believe are closest to the real area? ﻿b. What is the difference between the different values of d? Which is the most accurate do you believe? We will now use integrals to determine the true area under the curve, and then you can determine which of you hypothesis from above are correct!